In fact, you might even call him the Amazingly Poseable Spider-Man. 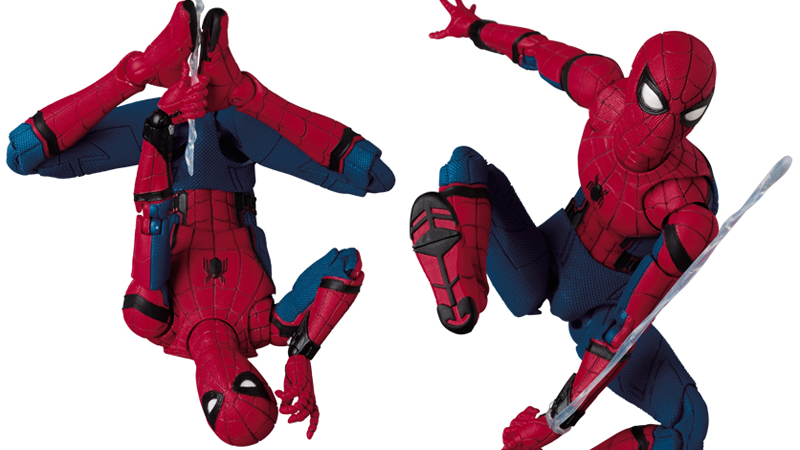 MAFEX has revealed its first 6" figure based on the MCU-approved Spidey of Homecoming and Civil War, and as with all the company’s action figures, it is just insanely articulated, letting you pose it in pretty much any Spider-pose you can think of. On top of that, it’s a really good-looking action figure—Tom Holland’s new Spidey suit really translates well to toys, and all the textured grooves of the webbing on the suit look great. On top of that, Spider-Man also comes with a load of accessories. Aside from the typical webbing attachments to make it look like Peter’s mid-swing or mid-thwip (and a stand to hold him in those poses), Spidey comes with an unmasked head, a “loose” mask for him to hold while using the unmasked head, and even two masked heads where he looks normal and... slightly suspicious? The difference is minimal, but it’s a welcome addition nonetheless. Mafex’s Spider-Man: Homecoming figure will hit shelves in Japan this October, where it’ll set you back the equivalent of around $60.